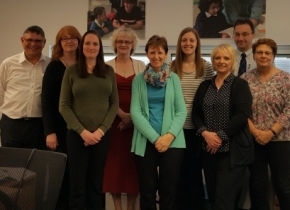 The Catch Up® team is made up of managers, office staff, trainers and trustees, who are all equally dedicated to helping as many struggling learners as possible with our proven interventions. To make sure that every new team member understands how the interventions work and the importance of them, every member of staff attends the Catch Up® training, for either Literacy or Numeracy (or preferably both!). All of our Catch Up® team have undertaken Catch Up® training, so they have an understanding of the issues struggling learners face, how the Catch Up® interventions can help those learners, how the interventions work – the four stages of Catch Up® – and some of the challenges involved in delivering and managing the interventions in schools. This helps us to support schools and trainees as they undertake their Catch Up® journey and begin to deliver and embed the interventions. “Going on the training was an excellent experience as it meant I could fully understand what it is the interventions do, and why what we do is so important. This really helps me when talking to deliverers on the phone. It was also great to train alongside teachers and teaching assistants who will actually be delivering the interventions so I can understand the experience for them, and it was great to see them so excited and keen to get started!” Kayleigh Bailey, Assistant Office Manager. Every person that attends the Catch Up® training instantly becomes part of the Catch Up® Community, which means they get lifetime support from our dedicated team, who are always on the end of a phone or email to help with any queries. Find out more about our team here and contact us, anytime!